For the first time since SpaceX landed at Boca Chica Beach, Cameron County closed a stretch of State Highway 4 leading to the beach for what’s called a tank test. And there will be more testing today. Cameron County Judge Eddie Treviño said he signed an order late Thursday closing the area for a second consecutive day so SpaceX can continue its testing. SpaceX performed numerous tests Thursday, he said. “They are fueling the engine and made numerous tests with regards to the fueling and everything,” Treviño said. 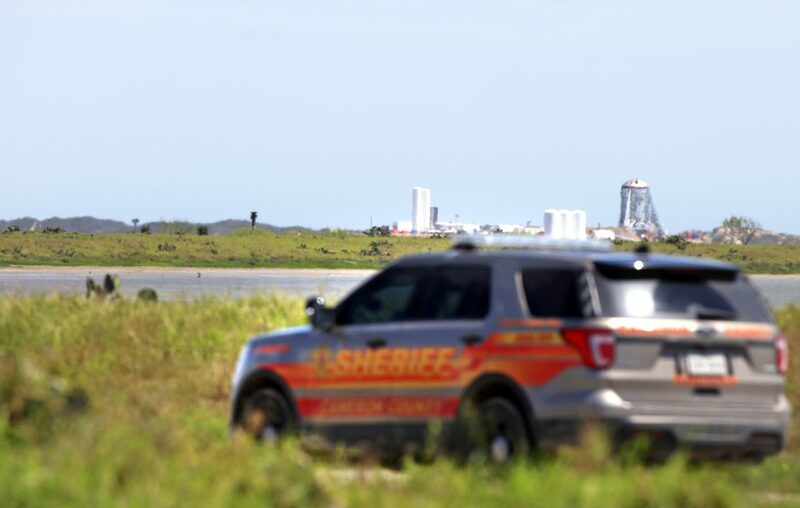 During an approximate six-hour stretch between 10 a.m. and 4 p.m. Thursday, eight loud noises reminiscent of the sound a jet engine makes when landing on a runway could be heard from a few miles away from the launch site at Maria Pointer’s residence. Pointer, who has long lived off State Highway 4, has a residence sandwiched between two other SpaceX locations on the highway that ends at the beach. Her house was inside the area closed off to the public so SpaceX could conduct spaceflight activities. In the past two weeks, SpaceX has confirmed that it would be conducting non-public testing of the Starship Hopper prototype’s newly installed ground systems, including performing a short static fire test. Throughout the day, SpaceX employees crossed east and west of the hard checkpoint, which appeared to be just to the east of the road that leads into Boca Chica Village. Over the approximate six-hour period, sheriff’s deputies also escorted two trucks with fishing poles in the beds out of the area. At one point, at around 1 p.m. a helicopter flew over the launch pad just after another loud noise came from the area. Toward 4 p.m. Thursday, workers could be seen in a lift working around the upper edges of the Starship Hopper prototype and on top of the vessel. Editor’s note: This story was updated to reflect new details about testing activities.